The Broad Street Walk of Stars is a walk of fame-style installation on the pedestrian pavement of Broad Street, Birmingham, England, which honours notable people from the Birmingham area or with significant connections with it. The scheme is organised and funded by the Broad Street Business Improvement District. The criteria for a person to have their star added to the walk include that they must have performed at one of Birmingham's major venues such as the International Convention Centre (ICC), National Indoor Arena (NIA), Symphony Hall and The Rep theatre. They must also be originally from the area or have prominent links with Birmingham and the Midlands region. The walk honours the residents of the city who have made a significant contribution in the categories of music, television, film, radio, theatre, sport, business and literacy. The idea for a Walk of Fame style tribute was first thought of by a local Birmingham man Garry Raybould, who then approached the Broad Street Business Improvement District who developed the idea and created the name Broad Street Walk of Stars together with a brand and registration of the original website, www.walkofstars.co.uk which quickly became very popular and was chosen by Radio 2 as 'Website of the Day'. 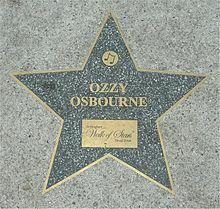 The first star to be honoured was Ozzy Osbourne on 6 July 2007. The event was held in Centenary Square and introduced by Elliott Webb from Birmingham's commercial radio station BRMB and the star was presented to Ozzy by Lord Mayor of Birmingham Randal Brew. The Ozzy Osbourne presentation created £1.7M worth of worldwide publicity for the area. Comedian Jasper Carrott was the second person to have a star installed on Broad Street on 15 September 2007. The star was presented to him by the Lord Mayor of Birmingham during ArtsFest in front of a 10,000 strong crowd. In December 2007, Noddy Holder became the third inductee on the Walk of Stars which was presented to him on a canal boat, during the Broad Street Christmas Canal Boat Light Parade. The stars were briefly fenced off following safety concerns about their polished surfaces. Leicestershire-based Charcon Specialist Products, who produced the stars, was consulted over the situation. Murray Walker was inducted into the Walk of Stars. A joint induction took place on 12 September 2008 for BBC Radio 4 series The Archers and cast member Norman Painting. On 7 October 2008, the BBC announced that Julie Walters would be inducted. The following month founder member of Black Sabbath, Tony Iommi was inducted. On 26 March 2009, it was announced that each of five local football clubs (Aston Villa, Birmingham City, Walsall, West Bromwich Albion and Wolverhampton Wanderers) would have a star commemorating their teams, a player, or a specific era. The presentation ceremonies will be staggered between May and August. 9 Tony 'Bomber' Brown 17 May 2009 Footballer Professional footballer from West Bromwich Albion F.C. 11 Gil Merrick September 2009 Footballer Professional footballer from Birmingham City F.C. 12 Ray Graydon September 2009 Footballer Former manager of Walsall F.C. 24 Laurie Mansfield 16 June 2011 Theatrical agent Represented Jim Davidson, Ken Dodd, Cannon & Ball, The Krankies, Tommy Steele, Eddie Large and Freddie Starr. 27 Malkit Singh May 2012 Musician "King of Bhangra"
33 Trevor Francis November 2014 Footballer Professional footballer from Birmingham City F.C. ^ "Ozzy's Coming Home - 6 July 2007 3pm - 4:30 pm". Birmingham Walk of Stars Broad Street. Archived from the original on 24 October 2007. Retrieved 18 October 2015. ^ Carrott on Brummie Walk of Stars, BBC News, 15 September 2007; retrieved 6 November 2007. ^ Walk of Stars is fenced off, Birmingham Mail, 26 October 2007; retrieved 6 November 2007. ^ Greatrex, Jonny (18 April 2009). "Aston Villa legends take place on Walk of Stars". Birmingham Mail. Trinity Mirror. Retrieved 21 April 2009. Wikimedia Commons has media related to Birmingham Walk of Stars.